DeathSpank: Thongs of Virtue (ToV) continues the DeathSpank series with another hilarious instalment in this action role playing series. The game released only a few months after the first game and is again available across all major platforms. Thongs of Virtue continues the adventures of DeathSpank and this time around has him hunting down the six Thongs of Virtue. The game is considered to be a second act in the DeathSpank story and closely related to the original game. There are little new features on offer with the sequel mostly focused on game improvements with new environments, bosses, weapons and a new multiplayer character for players. One of the few new features is the inclusion of ranged weapons which helps change up the games combat and ties in with the new multiplayer character. These range weapons don’t stick to the timeframe of the game setting and are futuristic focused with things like machine guns and bazookas. Fans of ranged combat will enjoy this new addition and won’t be forced to play a melee fighter like in the original. 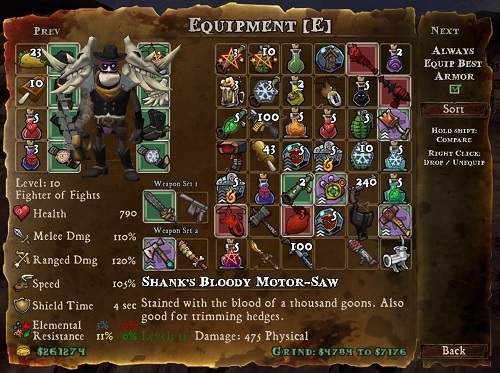 Other gameplay elements in DeathSpank: Thongs of Virtue are virtually identical to the original with players exploring the game world, talking to NPCs, accepting quests and eventually taking down a powerful end game boss. Dialogue returns as an important role in discovering the story and enjoying the comedy that the game has to offer. Combat still has a similar flow and has a Torchlight vibe to it. If the original DeathSpank was right up your alley you won’t want to miss the new instalment of the series. If you weren’t impressed with the first game though you’ll want to avoid the sequel since its essentially the same game with just a fresh adventure. Another hilarious adventure in the DeathSpank series. Hunt down the six Thongs of Virtue. Same focus on dialogue as the original. Another 15hrs worth of gameplay.